Greetings again from the darkness. How do you structure a film based on a true story that lasted 69 days, occurred 5 years ago, and was followed live on TV by half of the global population? Director Patricia Riggen (Girl in Progress, 2012) delivers a film designed to tug on heartstrings, and is based on the book “Deep Down Dark” from Hector Tobar, as well as interviews with the key players. In 2010, the San Jose copper/gold mine collapsed trapping 33 Chilean miners more than 2300 feet under tons of rubble and an unstable rock that dwarfed the Empire State Building. Through some pretty solid special effects, we are there for the collapse. It’s this segment and the immediate reactions from the miners that provide the film’s best segment. 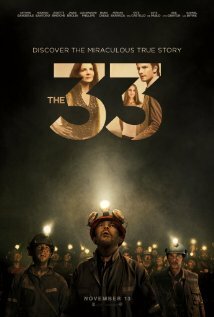 We feel the miner’s sense of panic and doom as they begin to come to grips with their plight. The film rotates between three struggles: the isolation of the miners struggling to survive, the tent city populated by their families struggling to maintain hope, and the Chilean government struggling with the politics and public relations of a rescue mission. From a character standpoint, each of these three segments is given a face. Antonio Banderas as Mario becomes the focal point of the miners. He searches for an escape route, takes charge of the (very limited) food rations, and acts as referee and light of hope in an extremely volatile situation. Juliette Binoche (yes the French actress) is Maria, the sister of one of the trapped miners and the most assertive of those pushing the government to attempt a rescue. Rodrigo Santoro plays Laurence Goldborne, Chile’s Minister of Mining, and the one who pushes the government to move forward with the costly rescue mission. 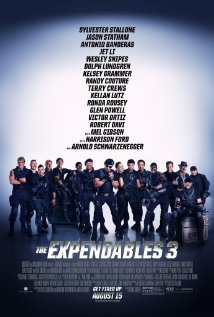 Other key characters include Bob Gunton as Chile’s President Pinera, Lou Diamond Phillips as “Don Lucho”, the safety inspector, Gabriel Byrne as the chief engineer, James Brolin as Jeff Hart (leading the U.S. drilling team), Naomi Scott as Mario’s wife, and three of the other miners: Oscar Nunez, Mario Casas, and Juan Pablo Raba. The most bizarre segment comes courtesy of miner hallucinations. It’s a fantasy-infused Last Supper sequence that plays out to the sounds of a Bellini opera, while the food and drink flow and the family members join in the joy. It’s not difficult to imagine the brain taking these poor gentlemen to such places of mental torture. As if the approach is to make the most viewer-friendly buried miner film possible, we aren’t witness to much underground conflict, and the internal bickering within the Chilean government officials is kept to a minimum. We do get to see the media circus that occurred during the ordeal … of course, most of us witnessed it in real time. Director Riggen has delivered a film that taps into the multitude of emotions for the different groups of people, rather than concentrating on the miserable situation of the miners. It’s a challenge to keep us interested in a true story of which we all know the ending, but most viewers will stay engaged with the characters. It should also be noted that the minimalistic score is some of the last work from the late, great James Horner. Greetings again from the darkness. Well it took six years, but co-directors Jonathan Dayton and Valerie Faris finally deliver their follow-up to the smash hit Little Miss Sunshine. With a script from first time screenwriter Zoe Kazan (granddaughter of legendary director Elia Kazan), we get an odd mash-up of would-be Woody Allen, Charlie Kaufman, Stranger Than Fiction, and a “Twilight Zone” episode. The story begins almost as a whimsical fantasy. Paul Dano plays Calvin, a blocked writer 10 years after writing the next great American novel, while he was still a teenager. The necessary comparisons to JD Salinger are made, and we witness Calvin as a socially-inept type who was never comfortable with his early success, and now can’t find a way to move on with life. Given a writing assignment by his shrink (Elliott Gould), Calvin discovers the true power of the written word is far beyond anything he had previously imagined. After a dream of meeting a lovely girl in the park, Calvin’s fingers tear through his manual typewriter and develop a story around his literal dream girl. And literal means literal. He runs into her downstairs. His creation has become his creation. Once he realizes they aren’t going to lock him away for insanity, Calvin and Ruby (also Zoe Kazan) begin a real relationship. Well as real as it can be with a girl who is not really real and whose actions can be changed simply by typing words on a page. If you think this sounds like a male fantasy, then you are in agreement with Calvin’s brother (Chris Messina). A trip to visit the brothers’ mothers (Annette Bening) and her boyfriend (Antonio Banderas) adds some humorous scenes while also signaling the beginning of trouble for Ruby and Calvin. It turns out that bringing your invented dream girl into the real world doesn’t always work so well. Who would have thought? There is much humor in the film including Steve Coogan as Calvin’s mentor. Deborah Ann Woll (“True Blood”) has a scene as Calvin’s ex-girlfriend and it is probably the best written scene in the film. Really good insight into how two people’s view of the same relationship can vary greatly. The story can be looked at from different perspectives. It certainly serves as insight into how a writer’s mind can work. Many writers need a muse … but few get to create their own! More importantly, it makes a statement on how we (well, not me) often try to control and manipulate the other person in our relationships. This is a sterling reminder to be careful what you ask for … you just might get it. Greetings again from the darkness. I will readily admit to being a huge Pedro Almodovar fan. His films regularly place on my “Best Of” list every two years. I so admire his creativity, tough women characters, visual acumen and multi-dimensional stories. With Almodovar, we can bank on some type of dalliance with death, a brush with sexual deviance, non-linear time lines, plots that twist and turn incessantly, a color palette to make Frida Kahlo envious and psychological darkness that forces us to look inward. All of these elements are present here … yet somehow it doesn’t quite click. Antonio Banderas plays Dr. Robert Ledgard, a plastic surgeon revered for his work in face transplants. What the medical profession doesn’t know is that Dr. Ledgard takes the mad scientist label to whole new dimension. And he does it with the coolness reserved for the other side of the pillow. I will not go into details of the story other than to say Banderas’ character would make Dr. Frankenstein turn away in disgust. Dr. Ledgard lives in a beautiful mansion with his protective housekeeper played by Almodovar veteran Marissa Paredes. He also has a live-in patient named Vera, played wonderfully by Elena Anaya. You will recognize Ms. Anaya if you took my advice and tracked down Mesrine parts 1 and 2. Support work is also provided by Jim Cornet as Vicente. I wish I could tell you more of the characters, but can’t without giving away too much. Dr. Legard and Vera are two of the most fascinating characters ever written by Almodovar, and the film is a twisted road to discomfort all wrapped up in a silky smooth picture frame. 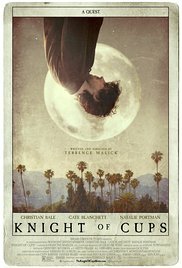 From a filmmaking perspective, I couldn’t rate it much higher. From an entertainment perspective, it would be near the bottom of the most interesting or desirable Almodovar films. Am I disappointed? Sure, a little. But not enough to override my excitement for the next film by Almodovar! SEE THIS MOVIE IF: like me, you must see every Almodovar film OR you want to see Antonio Banderas in his most intense role in quite some time.